Slice endivia, purple cabbage, chili peppers and young silver onions. Cut open 200g chicken breast. Mix 1 hand of flour with 1tsp. of Almazan spice mix. Whisk 2 egg yolks. Coat chicken breast with breadcrumbs, then in yolks and finally in flour with spices. Preheat deep-frying oil. Fry coated chicken breast for 5-7 min until golden brown crust. Finish off with unagi sauce and serve with greens and tomatoes. Bushcraft Tapas – 1 Year Old HamUltimate Bushcraft Pizza-Curry! 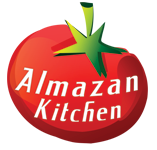 can you tell me the ingredients of your Almazan spice mix please?